So we started today. I won’t get into any live details or quotes from the day since it has all been informal and we’ve all agreed to not expose snippets from here without checking properly first. There will be a detailed report put together from this event afterwards. The most critical peace of information is however how we must not walk on the red parts of the sidewalks here in Münster, as that’s the bicycle lane and they (the bicyclers) can be ruthless there. We’ve had a bunch of presentations today with associated Q&A and follow-up discussions. Roy Fielding (HTTP spec pioneer) started out the series with a look at HTTP full of historic details and views from the past and where we are and what we’ve gone through over the years. Patrick Mcmanus (of Firefox HTTP networking) took us through some of the quirks of what a modern day browser has to do to speak HTTP and topped it off with a quiz regrading Firefox metrics. Did you know 31% of all Firefox HTTP requests get fulfilled by the cache or that 73% of all Firefox HTTP/2 connections are used more than once but only 7% of the HTTP/1 ones? 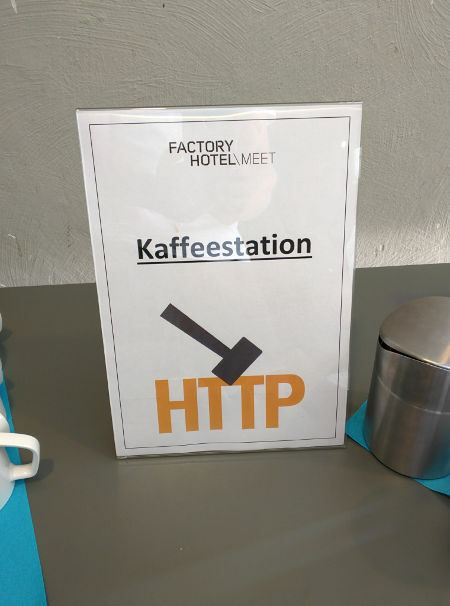 Poul-Henning Kamp (author of Varnish) brought his view on HTTP/2 from an intermediary’s point of view with a slightly pessimistic view, not totally unlike what he’s published before. Stefan Eissing (from Green Bytes) entertained us by talking about his work on writing mod_h2 for Apache Httpd (and how it might be included in the coming 2.4.x release) and we got to discuss a bit around timing measurements and its difficulties. We rounded off the afternoon with a priority and dependency tree discussion topped off with a walk-through of numbers and slides from Kazuho Oku (author of H2O) on how dependency-trees really help and from Moto Ishizawa (from Yahoo! Japan) explaining Firefox’s (Patrick’s really) implementation of dependencies for HTTP/2. We spent the evening having a 5-course (!) meal at a nice Italian restaurant while trading war stories about HTTP, networking and the web. Now it is close to midnight and it is time to reload and get ready for another busy day tomorrow.